When working hard on learning Chinese here, he found the city is fascinating as it is a linguistic hub where people speak not only Mandarin, but also Cantonese and other dialects. 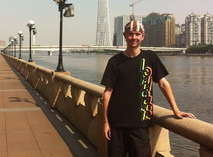 Let's get one thing clear from the start; yes, I'm another foreign teacher living in Guangzhou. No, I'm not using it as the means to an end. I get irritated when confronted by the lazy and ill-informed clichés about young teachers, encountered both at home and abroad. Granted, there are a number of people who go into teaching because they feel they "have no other options" open to them, or because they haven't decided what they "really want to do with their lives". I don't fall into either of these categories, and neither do a lot of other teachers I know, and I'm sure they get as tired as I do when constantly faced with these stereotypes. I've always had a strong interest in words, language and the subjects that surround them, and - whether this is the cause or the effect, I've never been sure - have always been strongest academically in this area. After college, I moved north from my small English home town to Manchester, and elected to do my degree in Linguistics in order to get a broader understanding of the underlying fundamentals of language; how we acquire it, how we shape it, and how we use it in all different facets of life. With the degree under my belt, I set about gaining other relevant qualifications to enhance my CV and further increase my chances of landing a teaching job. I worked as a humble office administrator during weekdays, worked towards my qualifications in the evenings and volunteered at a local language school at the weekends. At 26, as fate would have it, just as I was done in terms of passing my examinations, the company I worked for was bought out by a competitor, and a large proportion of the administrative staff, including me, were made redundant. This gave me the impetus to begin actively seeking out teaching posts abroad, with south east Asia, and China in particular, a location that I was especially interested in. This interest was borne primarily out of the unknown quantities of both the linguistic and cultural aspects of this corner of the world. The truth is, outside of China, little is known about modern China itself. The image we have of it in the West is a peculiar combination of the positive aspects that Beijing is happy to be fed into the global community - expensive and expansive transport infrastructure, giant panda mating successes, sporting achievement - and the more unsavory territorial, human rights, censorship and environmental disputes that make the headlines every now and then. I was eager to see for myself just how accurate a picture we had of the world's most populous nation, and it didn't take too much research to discover that there was a large demand for native English speakers to teach there, particularly in the big cities. And other than Beijing and Shanghai, both of which came off as impersonal, faceless and consumerist from comments and stories left online by expats who had spent considerable time there, they don't come much bigger than Guangzhou. The city sparked my interest as a host of fascinating dichotomies. Self-made millionaires speed around in Porches whilst local farmers toil long hours for enough money to feed their families. Glistening skyscrapers stand proud over ramshackled stone and wood houses, built by their occupants' grandfathers. Vast piles of Tarmac, concrete and steel sit waiting at building sites, overlooking beautiful wooded vistas and rivers. Ancient pagodas stand shoulder to shoulder with Starbucks and KFC. The most fascinating of all, to me, was the linguistic relationships between the nation-wide Mandarin, the province-wide Cantonese, and the local dialects. In fact, the whole concept of a large proportion of a nation's population not speaking the national language as their first choice was mind-blowing for me, and warranted further investigation. I spent the whole of last year in the "under construction" region of Huadu, on the fringes of Guangzhou, but then relocated to the more central Tianhe at the beginning of this year, where I was offered more amenities, less staring and more opportunities. Whilst being in the center of such a diverse linguistic hub is a vastly stimulating and fascinating experience, there are drawbacks. My primary personal goal is to improve my Mandarin to a level similar to that of my older students (5-6 years of age) by the end of the year. I opted to go with Mandarin in terms of learning the "local" language, primarily because Cantonese wouldn't have done me much good outside of Guangdong, and I wouldn't have been likely to have much exposure to it outside of China. I quickly discovered, after a lot of initial confusion, that whilst the vast majority of the locals could converse in Mandarin, they weren't always one hundred percent comfortable with it, and often their pronunciation would differ wildly from the standard, which I'd been learning from. Whilst perusing the city's many marketplaces, instructing a taxi driver or ordering food at a small corner restaurant, I found that I had to be extra careful with certain words when communicating with natives, or trouble was likely to occur. A recurring issue was the problematic "sh" sound - absent from Cantonese but fairly common in Mandarin - and differentiating between the numbers four ("si") and ten ("shi"). It still catches me out, but I have a better appreciation for it now, as well as the reluctance sometimes to even speak Mandarin if it's not necessary. I spent a lot of time researching the relationship between Basque and Spanish whilst at university, and whilst less volatile, there are parallels here, and equally important reasons for the Cantonese to maintain their identity. Language is a crucial part of this. With regards to the future, I'm very happy where I am for now, and have signed a contract for another year at my current school. I'm certain that Guangzhou isn't where I want to settle ultimately, not for any outstanding detrimental reasons, it simply isn't home, and never will be. However, the experiences I've had, the lessons I've learned, and people that I've encountered will live long in the memory. It's an adventure that I can look back on in fifty years' time and feel proud that I was brave enough to take myself out of my comfort zone, on my own, and set up a new life in an alien culture halfway around the world. If it inspires just one other person to do the same, it'll have been well worth it.